What are mermaids? A mermaid is a mythical creature that is half women and half fish. The name comes from ''mer'' what means sea. The male version is called a merman. 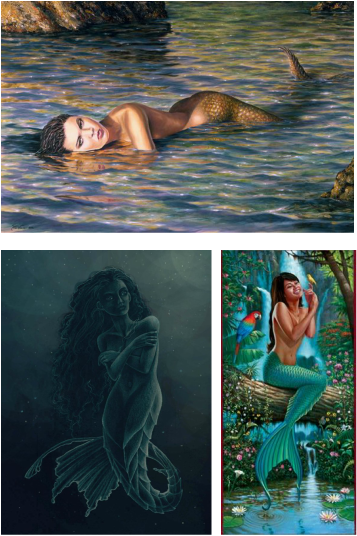 Although some mermaids are described as monstrous and ugly, they are more usually very beautifull. Above the waist they appear as a lovely young women and from the waist down, they are like fish with fins and and a beautifull tail. They are just beautifull, i've never ''met'' one and i also don't know if they actually exist. There are sightings of mermaids and animal planet made a documentary about the bloop. It's about a weird sound coming out of the ocean. A boy also found a body at the beach. You really have to check it out. There is also alot of acting in it but the bloop is real. Spells and Shifting: You can do spells and shifting to become a mermaid. But you have to believe in it. I don't want you to think weird things now but it's real there are some mermaids out there. You don't have to believe it. But i do, i believe that some people actually are mermaids by doing spells and shifting. You can find spells on this website and ways how to shift. Shifting is actually finding your inner mermaid. Think like a mermaid and act like a mermaid.